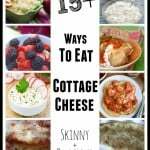 A lighter, healthier way to enjoy all the flavors of a Big Mac with fewer calories and no bread this Skinny Big Mac Salad Recipe is a new lunch and dinner favorite. 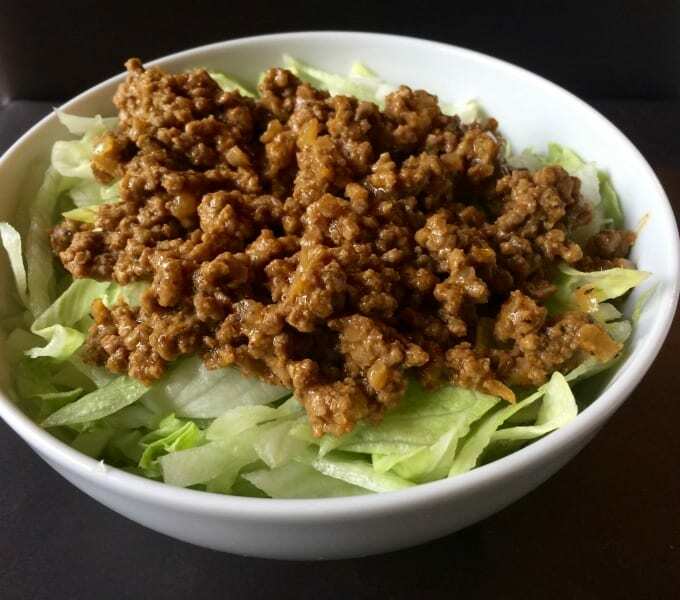 Seasoned ground beef atop a heap of shredded lettuce topped with a sprinkling of shredded cheddar cheese, sesame seeds chopped pickles and a light and zesty “special sauce” this salad is sure to satisfy in just 20 minutes or less. 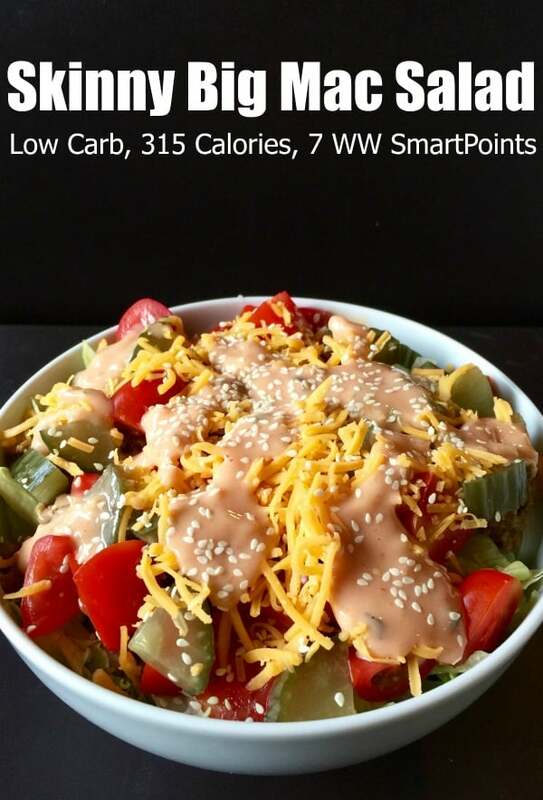 How Many Calories/WW Points in this Skinny Big Mac Salad for One? According to my calculations this salad has 316 calories and *7 Weight Watchers Freestyle SmartPoints. How To Make this Work with WW Simply Filling/No Count? 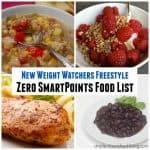 Use fat-free thousand Island dressing, fat free cheddar and non-calorie sweetener instead of sugar. I love to top this salad with plenty of juicy chopped tomatoes and an extra drizzle of ketchup and mustard. 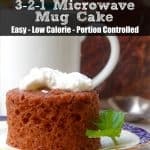 Although this recipe is written for one serving you could easily double, triple or quadruple the ingredients to feed your family. To make a vegetarian version simply substitute your favorite cooked and crumbled veggie burger for the extra lean beef. 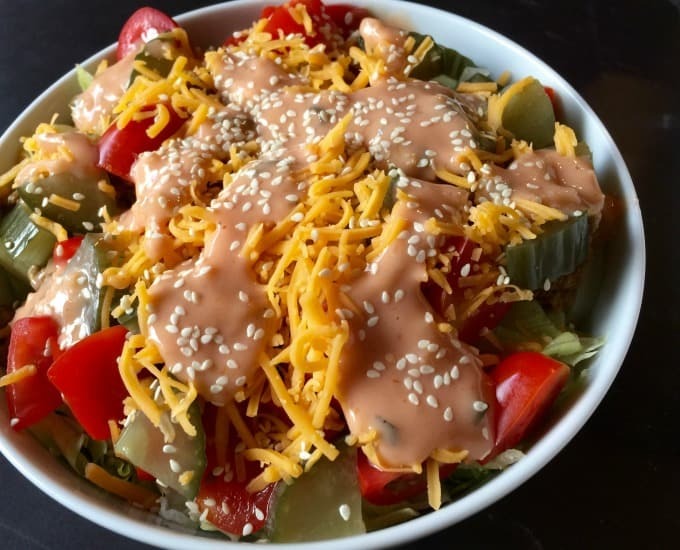 To keep life easy the special sauce in this Skinny Big Mac Salad Recipe begins with bottled light Thousand Island dressing. If you prefer to make your own, this one from The Food Network looks good. 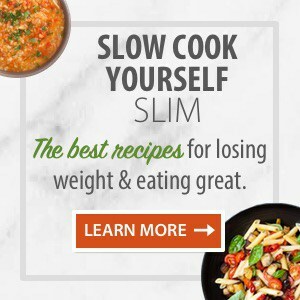 In a small bowl (affiliate link) stir together light Thousand Island dressing, finely minced onion, granulated white sugar (or a dash of no-calorie sweetener) and vinegar until blended. Set aside while you make the salad. Bring a skillet sprayed with nonstick spray to medium-high heat. Add beef, onion, and seasonings. 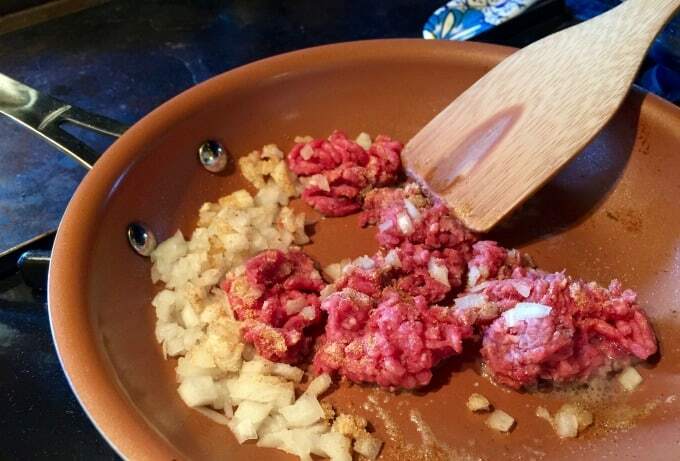 Cook and crumble until beef is fully cooked and onions have softened (about 5 minutes). Remove from the heat. 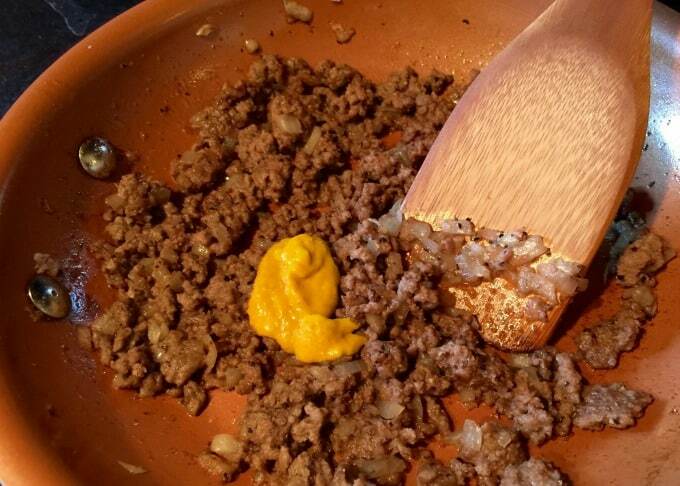 Add mustard and stir until well mixed. Top with the cooked ground beef mixture. Top with shredded cheese, dill pickles, sesame seeds and any other optional ingredients you like. Enjoy! If you’ve made this Big Mac Salad, please give the recipe a star rating below and leave a comment letting me know how you liked it. 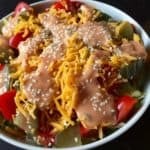 Light, healthy low carb skinny big mac salad for one has all flavors of your favorite special sauce topped cheeseburger with 315 calories and 7 Weight Watchers Freestyle SmartPoints. chopped tomato, ketchup, yellow mustard, chopped onion, etc. 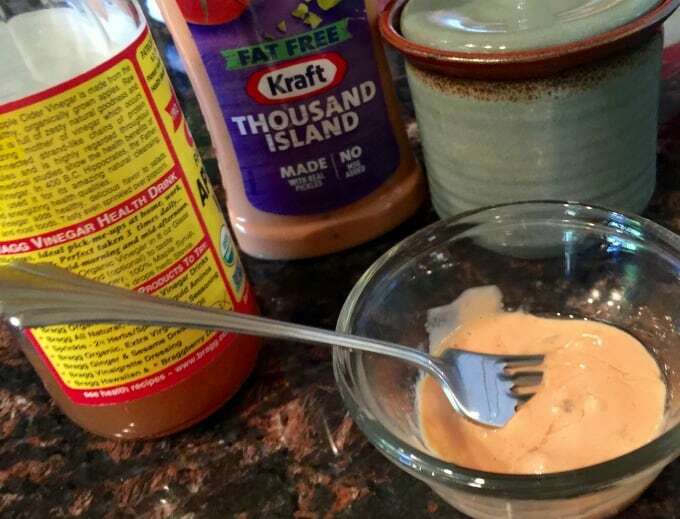 Make the sauce: In a small bowl, thoroughly mix together the Thousand Island dressing, onion, sugar and vinegar. 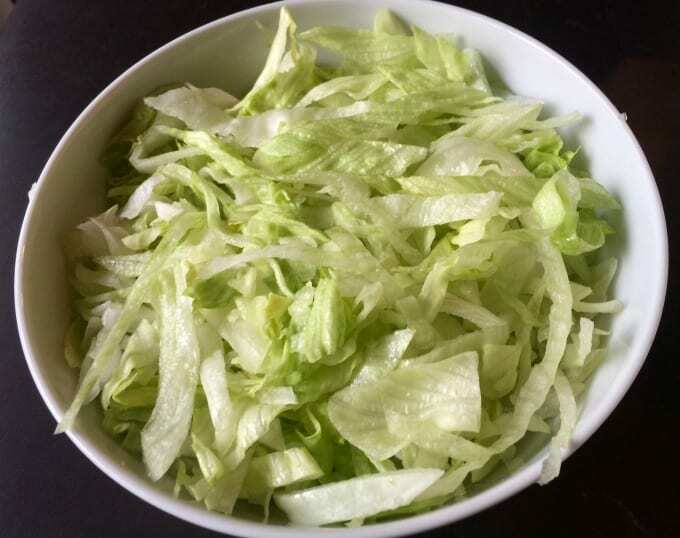 Assemble the salad: Place lettuce in a large bowl. Top with the beef mixture, shredded cheese, dill pickles, sesame seeds and any other optional ingredients you like. 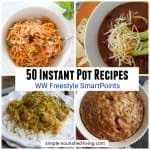 I signed up & received you 10 Favorite recipes. Points too high. They are outdated. Replace the sugar with Stevia. 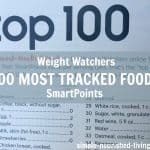 Watch some modern YouTube videos from WW members that are losing successfully…I’m down 52 pounds. Only 1.4 pounds from my goal of 124. I don’t eat white sugar. Absolutely LOVED it! Will definitely make it again….and again!! 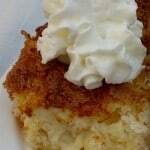 Used dash of artificial liquid sweetener, fat free cheddar cheese & fat free salad dressing…..4 freestyle Pts.